1. Boil noodles. Drain, rinse, and let air dry dry. Set aside for later. 2. Wash all veggies and greens. Let air dry and set aside for later. 3. Chop lettuce, julienne cucumber, and sliced the sweet onions. 4. Marinate beef with 1tbl oyster sauce, 1/2 tbl fish sauce, 2 tsp brown sugar, 2 tbl cooking oil, 1 teaspoon mushroom seasoning, 1/2 tsp of black pepper, 1 tbl minced garlic, 1 tbl minced shallots. 5. Heat up oil in a pan, stir fried beef on high heat. Add the sweet onions towards the end and stir fried along with the beef. 6. In a bowl, assemble vermicelli noodle, lettuce, cucumber, pickled veggies, and fresh herbs. Top off with stir fried beef and onions and a sprinkle of roasted crush peanuts. 7. Enjoy with some sweet fish sauce! I love eating raw fish and it's just natural for me to be a poke fanatic! Poke is everywhere nowadays and there are so many take on it. Honestly I like it very simple because I don't want to mask the wonderful fish with too many ingredients. I've been blessed to learn how to make poke from real Hawaiians and with many trial and error I have come up with a recipe that I love. Some people are afraid to make poke at home because you are dealing with raw fish. But that's what poke is so you just have to get over it. When it comes to raw fish, there are different grade. I have used all different grade of fish; from chain grocery stores to sashimi grade from Japanese market and I have never gotten sick. You will taste a difference in quality and of course there will be a difference in prices. I personally like to use Costco's fish especially during their seafood road show. Or ask your seafood person at your favorite grocery store when they get their fresh fish every week. If you feel uneasy about working with raw fish, you can buy sashimi grade fish from most specialty stores. If you are novice to poke, I think salmon would be a good fish to start with. Fishes such as tuna or trout has a stronger smell when raw. Salmon is more mild and clean tasting in my opinion. I personally love eating salmon poke because when you can get a fatty cut, oh it melts like butter! 1. Clean fish and then pat dry. Cut into 1/2 inch cube. 2. I like to marinate the fish with soy sauce and salt first so this will soak into the fish first. Mix gently avoid bruising the fish. 3. Add the sweet onions, serrano pepper, green onions, garlic, crushed Thai chili, and sesame oil. Again mix gently and thoroughly. Let marinate in the fridge for at least 30 minutes. 4. Transfer to plate and top off with roasted sesame seed. Xà Lách Trộn Thịt Bò is my kind of salad, it's a healthy option but still incredibly flavorful! Sometimes you feel so overwhelmed by food but you still want something tasty to eat, this is usually what I turn to. 1. Marinate the sliced beef with 1 teaspoon of salt, 2 tablespoon of fish sauce, 1/2 tablespoon spoon sugar, 1 tablespoon of minced garlic, 1 tablespoon of minced shallot, and 1 tablespoon of cooking oil. 2. Wash and drain all veggies dry (lettuce, tomatoes, onions). Boil eggs and cut into quarters. Thinly sliced the onions and soak in cold water (this helps reduce the onion flavor). 3. Combine juice of one lime, 1 tablespoon of sugar, 1/2 teaspoon of salt, and teaspoon of ground pepper. 4. Heat up a pan with 2 tablespoon of cooking oil. Add marinated beef and sauteed. 5. In a mixing bowl add the lettuce, tomatoes, and onions, and dressing from step #3. Toss everything together. Transfer to a plate and then pile the sauteed beef and eggs on top. There is a fear when my generation hear the words 'Giò Heo' which translates to pig's feet/hock/trotter. But I promise it is one of the best piece of meat you can gnaw on! When you bite through that soft skin, you will then sink into the sweet tender meat. After you finish all the meaty parts you will have to work through the chewy tendons and cartilage, my favorite part. I love the layers of texture of 'Giò Heo' and if you love that too, you will love this soup! Unlike the familiar thicken soup from Banh Canh Cua, Banh Canh Gio Heo has a more traditional soupy broth. It's simple, clean, and to the point that brings out the natural flavor of each ingredients. While most Banh Canh Gio Heo has more of a pork base broth I like to use ground shrimp for that extra sweetness. 'Giò Heo' is already heavy as it is so I try to lighten the broth as much as possible by using shrimp. 1. Par boil the pork hock with plenty of salt and 1/4 cup of vinegar. Drain dirty water and wash hock thoroughly with cold water. 2. Rinse and peel the shrimps but save the shell. 3. Add the shrimp shells, pork hock, and 3/4 of the sweet onions to a pot and add 4 quarts of water. Simmer everything in pot to make the broth. Season with 2 tablespoon of salt, 1 tablespoon mushroom seasoning, and 1/2 tablespoon of sugar. Remove scum as needed. 4. Divide peeled shrimp in half. Take 1/2 of the shrimp and ground it with a food blender then set a side. 5. Take the other half and cook the shrimp whole in the broth from step #3. Once shrimp is cooked remove from broth and set aside. 6. Pay attention to your pork hock, I like mine on the chewy side. Cook hock to your preference and remove from broth. 7. Remove the shrimp shells from the broth. 8. Scoop ground shrimp into the broth, let broth come to a boil and then turn down heat. Remove any scum as needed. 9. Make final tasting by adding additional salt and sugar as needed. 10. Chop up cilantro, green onions, and sliced the 1/4 sweet onions for garnishing. Prepare lime wedges and chili for eating. 11. Boil the banh canh noodle ahead of time. 12. Add noodles to a bowl top with pork hock and cooked whole shrimp. Ladle in the broth, add cilantro/onions mixture, fried shallots, lime, and fresh chili to your liking. Enjoy pork hock by dipping it in a little bit of fish sauce mixed with fresh chili. When I was little I always correlate chao with being sick. Supposedly you are not suppose to eat anything fatty or overly seasoned because it might irritate your stomach while your sick. Therefore when I was sick my mom makes chao with very little seasoning and no meats, it totally scarred my taste buds. I don't think I ever liked eating chao until I reach my 20s when I finally learn how to cook it myself. Chao doesn't have to be bland, remember you control the seasoning and flavors when you cook. I will show you a few tricks that will give your chao wonderful flavors and aromas! Everybody likes chao a certain way! Some people like it very watery and the rice grain still intact while others like the rice grain to be cooked down into a thick paste like consistency. I love my chao to be cooked down completely, in which you can't even see any sign of the rice grain or liquid, as if the rice and the broth has become one. The best way to achieve this is to avoid washing your rice, rice is covered in starch which will naturally thicken your broth. Add unwashed rice straight to the broth. Be patience and let your rice grain cook down until it disintegrate into the broth. I like my chao to be well seasoned and aromatic from ginger, garlic, and shallot. And like most soups, the best way to bring out the flavors from your roots is to roast them before ending them to the broth. The best way to season chao is with just salt, that will give your chao enough taste without overpowering like fish sauce will. 1. Par boil the chickens and drain the dirty water. Rinse chicken clean with cool water. 2. Add clean chicken to pot cook for 30 minutes, remove and let cooled down. 3. Roast your roots either in the oven or in pan on the stovetop. 4. Add the rice to the broth along with the roasted garlic,shallots, and ginger. Season with 3/4 tbl salt, 1/2 tbl sugar, 1/2 tbl mushroom seasoning. 5. Let rice cook down on medium heat. It will be faster if you cover with lid. Every now and then scrape the bottom of the pot to ensure rice isn't sticking to the bottom. 6. Once chicken has cooled, remove bones and shred into smaller pieces. 8. Once the rice has cooked down to your liking, add the chicken to the chao. Chả Trứng has many identities such as egg pie, egg cake, egg loaf, Vietnamese quiche. You can call it whatever you want but we all know what you mean, the yellow square or triangle that come along with Vietnamese pork chop ' Cơm Sườn'. Honestly sometimes i'm totally content with eating egg pie, hot rice, and sweet fish sauce! 1. Rehydrate the wood ear mushroom and dried bean thread by soaking in hot water. Use scissors to cut up the bean thread. Once they have soften, make sure you squeeze off excess water. 2. Combine 3 eggs, ground pork, minced green onions, wood ear mushroom, bean thread, salt, fish sauce, sugar, and pepper. 3. Separate the yolk from the remaining 5 eggs. We will not be using the whites so you can use for other things. 4. Coat your baking dish with some oil. 5. Pour step #2 into your baking dish and make sure the surface is flat and even. 6. Mix the 5 egg yolks from before and pour on top of the pork mixture. 7. In a large pot add enough water so that it will come up 1/2 way to your baking dish. Put on the lid and steam on medium heat. If you would like to you the oven, you'll need a larger baking dish and same concept you'll need to add enough water so it comes up 1/2 way to your smaller baking dish. Wrap with foil and bake on 400 degrees until egg pie is cooked all the way through. The best way to know when your egg pie is fully cooked is using toothpick just like you were testing a cake. If it comes up clean, you are done! 8. I like to steam and it took about 45 minutes to cook completely. If you are steaming, pour liquid condensation away. Let egg pie cool down completely before cutting into it. Every time somebody ask me to make Banh Xeo for them I cringe and ask politely to pick another dish, actually it's more like 'pick something else or you don't eat'! I hate making banh xeo; it takes forever, you get oil spatter everywhere, and you and everything in your house end up smelling like fried food for days. But if I don't have to make it myself, I absolutely love it! Banh Xeo is a popular street food made from a rice flour batter fried into a crispy crepe filled with pork belly, shrimp, and bean sprouts. 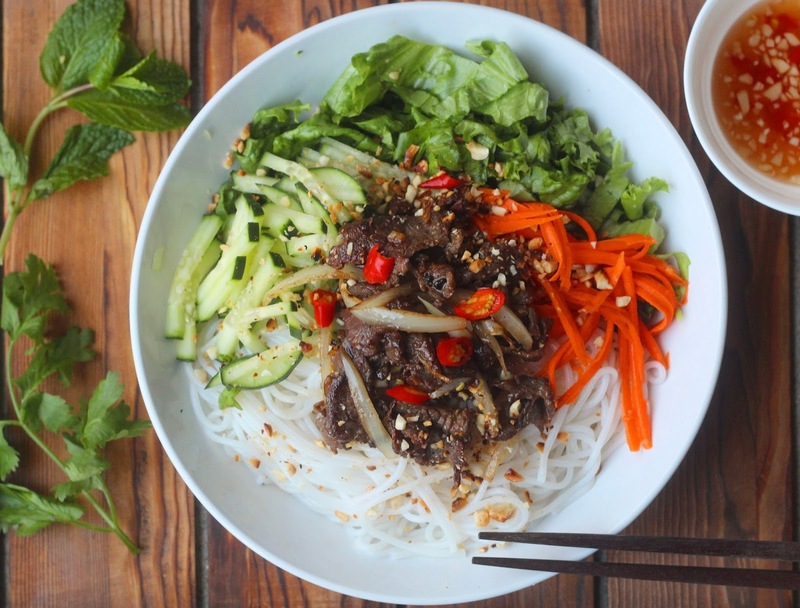 You eat it with a lot of fresh veggies and herbs and dipped in sweet fish sauce. I always crave it on the hottest summer day when my family's garden is at its peak with plentiful of herbs. When somebody makes it for you, appreciate it because it is a labor of love. I can still remember when I was little at my grandma's house, my mom and her sisters were in the kitchen making banh xeo as we wait to eat them fresh right out of the frying pan. That's the only way to eat banh xeo, hot and sizzling! 1. Always let your batter sit overnight to rest (ie Banh cuon, banh khot, banh beo) this will allow the flour to expand and won't become rubbery. 2. The first couple of banh xeo will usually be the worst! Your frying pan needs time to adjust to the heat and oil. 3. Use a light pan which will be easy for you to turn/rotate which will help you distribute the batter more evenly and thinly. 4. Don't use too much oil it will absorb into the batter and become soggy. Don't use too little oil it will not become crispy. You will figure this out as you cook. 5. Stir the batter especially at the bottom before every use. 6. You can cook your pork belly and shrimp ahead of time to speed up the cooking the process. 7. Use a specific ladle or a measuring tools to help you stay consistent with how much batter you'll need to use according to the size of your frying pan. 8. Use a nonstick pan or you will be sorry. I use one that has an aluminum coating. 9. Use a cooking brush (or paper towel or cotton) to evenly brush/spread oil onto your pan. 10. Use cheap beer that is really carbonated like Bud Light. 11. Don't be scared, the outcome will be worth it! Batter: This will make about 20-25 crepes. 1. If you like to cook your pork belly into the batter then do this first. Add sweet onions at the very end. You can use as much pork belly and shrimp as your like. 2. Once your meats are cooked brush the surface of your pan with oil and wait for the pan to be hot ( not smoking hot) but you should be able to feel the heat. Pour batter evenly in the pan, rotate/turn your pan so the batter coats the pan evenly. You can always add more to fill in the spot. 4. Uncover the lid. Lift up the crepe from the pan and I like to add a little bit more oil, turn down the heat a bit and let it fry until crispy. 5. Fold the crepe in half and remove from pan.